In partnering with Braebon, SomnoMed now has the first FDA approved mandibular advancement device in the US that has the capability to objectively monitor the number of hours that the patient uses the device over several months. At SomnoMed, we believe in constant innovation, and we are confident that the compliance monitor is the future standard for COAT treatment. The ability to monitor compliance with an oral device offers significant benefits to the patient, the dentist, the physician, employers and even the payer. Patient: Compliance monitoring is not an intrusion, but rather a way for the patients to feel empowered. When the patient goes into the physician’s office they can now take ownership of the treatment outcomes and have a meaningful partnership with their physician. Patients increasingly want to be an active participant in their own care, and this is a powerful tool that will enhance their ability to do so. Dentist: With compliance monitoring, the dentist now has a way to collaboratively work with the patients and the physicians. As a sleep physician, if I work with a dentist that is committed to outcomes and cares about the effectiveness of treatment as well the compliance of the patient, then I know I have a partner I can rely on. I believe that as the field matures, dentists that use the compliance monitor and work closely with their patients and physicians in the chronic care of OSA will positively differentiate themselves from dentists who do not. Physicians: Physicians commonly use CPAP as monitoring compliance is part of the standard of care. Medicare does not even reimburse if compliance is below a set standard. As a part of our patient care routines, we ask our patients if they use their medications, we objectively monitor CPAP compliance, and it is just a matter of time before this new innovation becomes the new standard. I would encourage all physicians writing a prescription for oral device therapy to write a prescription that include monitoring capability. 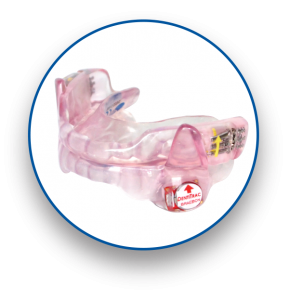 Employers: For employers – especially those in the transportation industry – compliance recording in oral devices offers a solution that compares with CPAP in terms of reliable compliance monitoring. Physicians will feel much more comfortable prescribing effective COAT therapy. Transportation workers, including commercial drivers and pilots, will have more options. Payer: Compliance monitoring in oral devices changes the paradigm for payers. Enlightened payers should be willing to reward patients for compliance with treatment. After all, if the patient uses an effective treatment, then health outcomes improve and overall cost of care drops. So…to the skeptics, I say that the compliance monitor will result true partnership between all of the participants invested the treatment of OSA. Compliance monitoring in oral devices is the future of COAT, and we at SomnoMed are proud to be at the forefront of patient centered innovation. SomnoMed is global leader in COAT™ (Continuous Open Airway Therapy), manufacturing devices indicated for use for patients who fail CPAP therapy, as well as patients with mild-to-moderate obstructive sleep apnea (OSA). SomnoMed’s devices are FDA cleared and manufactured under ISO 13485 quality standards. Learn more by clicking here, or call 1-888-447-6673.